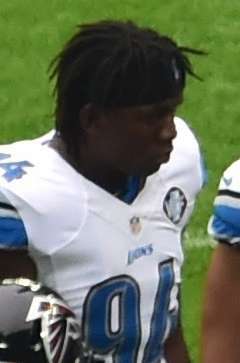 Ezekiel Nana "Ziggy" Ansah (born May 29, 1989) is a Ghanaian-born American football defensive end for the Detroit Lions of the National Football League (NFL). He was drafted by the Lions fifth overall in the 2013 NFL Draft. He played college football at Brigham Young. Ansah grew up playing soccer and had never seen American football as a youth. In addition to soccer, Ansah was also an enthusiastic basketball fan. He regularly played pickup basketball games at Golden Sunbeam Montessori School where he attended from 4th grade to 9th grade. He developed his basketball interests and abilities on a turf donated by Forever Young Foundation (Steve Young). Ansah played on the Golden Sunbeam basketball team and became the most valuable player and led his team to win many games. Because of the school's basketball facility, attention was drawn from basketball enthusiasts including missionaries of The Church of Jesus Christ of Latter-day Saints (LDS Church). It was at these pickup basketball games with missionaries and students that Ansah developed a friendship with Ken Frei, an LDS Church missionary. Ansah was later baptized a member of the church at age 18. Frei, who taught and baptized Ansah, kept in touch with Ansah after returning to the United States. Frei later suggested that if he was serious about basketball, Ansah should come to Brigham Young University and try out for the basketball team. Ansah joined the Presbyterian Boys' Senior Secondary School, Legon in 2004. He studied business. During his stay in the school, Ansah actively participated in sports, playing an active role in the basketball team while also participating in track and field sports. During his stay in high school he was a resident of Kwansa House. He graduated from High School in Ghana in June 2007 and returned to Golden Sunbeam as a Teaching Assistant where, in his spare time, he trained the pupils in basketball. Under his mentoring the Golden Sunbeam basketball team won several tournaments while playing international schools in Ghana. When the West African Senior Secondary Certificate Examination (WASSCE) results became public, Ezekiel had 7A's and a B in his Business program. Ansah applied to and was accepted at Brigham Young University with the help and support of Golden Sunbeam and the assistance of his friend, former ICT teacher and mentor, Alma Ohene Opare who was at BYU at the time. Ezekiel's academic records enabled him to receive an academic scholarship in 2008. Alma Ohene Opare and later Ken Frei played critical roles in helping Ezekiel Ansah adjust to his new surroundings and culture in a new country. Ansah tried out for the BYU Cougars men's basketball team twice, but was cut from both the 2008 and 2009 teams. After facing rejection in basketball, Ansah successfully walked on to the BYU Cougars track team, where he ran a 10.91 in the 100 meters in addition to clocking a time of 21.89 seconds in the 200 meters. Finally, Ansah was persuaded to try out for the BYU Cougars football team, successfully walked onto the team, and played for the Cougars from 2010 to 2012. Unfamiliar with American football, Ansah had to be instructed in the most basic rules and techniques, even needing help getting on his pads for the first time. Mid-way through the 2010 season Ansah made his first collegiate appearance in the Cougars' game versus Wyoming where he recorded his first tackle. During the 2010 season he saw action in six games on special teams and the defensive line, recording three tackles and a pass breakup. The 2011 season was Ansah's fourth year in school but only third year of eligibility. He played sporadically on third downs as a defensive end or outside linebacker, recording seven total tackles for the season. For the 2012 season Ansah resumed his role as a situation player. However, during week four, noseguard Eathyn Manumaleuna hurt his knee and Ansah took his place. Over the final nine games of the season Ansah was third on the team in tackles (48), second in sacks (4.5) and first in tackles for loss (13). For the 2012 season, the BYU Cougars led the nation in red zone defense (opponent red zone percentage of .62), was second in rushing defense (84.25 yards/game), third in 3rd down conversion percentage (27.71%) and total defense (allowing 26.33 yards/game), fourth in First Downs defense (14.83/game), and fifth in scoring defense (176 total points). Additionally, they were in the top 25 in passing defense (13th), quarterback sacks (22nd), fourth down conversion defense (23rd), and tackles for loss (25th). Ansah was not found on any of the 2012 preseason mock drafts for the 2013 NFL draft. By mid-season, he had moved up from unlisted to the late-first round or early second round with many analysts calling him the sleeper pick of the draft. Ansah further improved his draft stock with his "outstanding defensive player" outing in the 2013 Senior bowl, where he recorded seven tackles (six solo), 1.5 sacks (for 13 yards), 3.5 tackles for loss (for 24 yards), a pass breakup, and a forced fumble. In March 2013, reports began to circulate questioning the accuracy of Ansah's age. His passport, however, shows his date of birth as May 29, 1989. Ansah was drafted by the Detroit Lions, in the first round, with the fifth overall pick, of the 2013 NFL Draft. He signed a five-year rookie contract with the Lions on May 10, 2013. In the first week of the preseason, Ansah intercepted Mark Sanchez and returned the ball 14 yards for the first score of the game. During the 2013 season, Ansah finished the year with 8 sacks, leading all NFL rookies, and ranked second in Lions rookie history. He was named the Mel Farr Rookie of the Year, honouring the Detroit Lions' most outstanding rookie. In the 2015 season, Ansah ranked third in the NFL in sacks with 14.5. He tied William Gay (13.5 sacks in 1983) for the second-most sacks in a season by a Lions defensive player since 1982, trailing only Robert Porcher (15.0) set in 1999. Ansah was named to the Pro Bowl for the first time in his career. On May 2, 2016, it was announced that the Detroit Lions exercised the fifth-year option on Ansah's contract. Ziggy is the youngest of five children. His father, Edward, was a sales manager for a petroleum company, and his mother, Elizabeth, was a nurse. Ansah is an active member of The Church of Jesus Christ of Latter-day Saints (LDS Church). Ansah was assigned to room with Kyle Van Noy, a highly touted linebacker, during the 2012 season. The two have maintained a close relationship both on- and off-the-field. Ansah reported in a Sports Illustrated interview that, "Kyle is like a brother to me." While attending BYU Ansah worked for several years as a custodian in order to pay his tuition (he stopped working when he was awarded a scholarship his senior year). 1 2 3 4 5 6 "The Next Zig Thing". Sports Illustrated. 2012-12-03. Retrieved 2012-12-07. ↑ Jones, Lindsay H. (2013-04-10). "Ziggy Ansah speeding through learning curve". USA Today. Retrieved 2013-04-24. ↑ Benedict, Jeff (2012-11-29). "Sports Illustrated to profile football odyssey of BYU's Ziggy Ansah". Deseret News. Retrieved 2012-12-07. ↑ "BYU Getting Ziggy With It". Deep Shades of Blue. 2012-08-01. Retrieved 2013-04-24. ↑ "Unheralded BYU defensive end Ezekiel Ansah has stepped into spotlight". Deseret News. Retrieved 2012-12-07. 1 2 "Ezekiel Ansah". BYU Athletics. Retrieved 2013-04-24. ↑ Pauline, Tony (November 8, 2012). "Barkevious Mingo, Bjoern Werner, Star Lotulelei in top 50". SI.com. ↑ Rang, Rob (December 4, 2012). "2013 NFL Mock Drafts". CBSSports.com. ↑ "Walter Football 2013 Mock Draft". WalterFootball.com. December 4, 2012. ↑ "2013 NFL Mock Draft Two Rounds of Bliss". NFLsfuture.com. December 4, 2012. ↑ "2013 Senior Bowl Stats" (PDF). Seniorbowl.com. January 29, 2013. ↑ "NFL Combine Player Profile: Ziggy Ansah". NFL.com. February 27, 2013. ↑ Mortensen, Chris (2013-04-18). "Ezekiel Ansah's passport viewed". ESPN.com. Retrieved 2013-04-24. ↑ Seiferth, Kevin (April 25, 2013). "Ezekiel Ansah: Big swing with game on line". ESPN.com. ↑ Associated Press, "Lions sign top draft pick DE Ezekiel Ansah to 5-year contract, 8 others to 4-year deals," The Washington Press (May 10, 2013). Retrieved May 19, 2013. ↑ Birkett, Dave. "Detroit Lions 26, New York 17: Ziggy Ansah's interception, score key Lions' preseason win". Retrieved August 9, 2013. ↑ Twentyman, Tim (January 8, 2014). "Ziggy Ansah named Mel Farr Rookie of the Year". NFL.com. Retrieved July 31, 2015. ↑ Twentyman, Tim (December 22, 2015). "Two Lions named to 2016 Pro Bowl". Detroit Lions. Retrieved December 22, 2015. ↑ "Lions exercise fifth-year option for DE Ziggy Ansah". www.detroitlions.com. Retrieved 2016-05-02. ↑ "Ezekiel Ansah Stats". Retrieved 13 November 2015. ↑ Ogletree, Brandon (11 September 2013). "The Meteoric Rise of Ziggy Ansah". OgletreeFootball.com. Retrieved 11 September 2013.